Our visit to Morocco ended on a Thursday, and as Adam and I looked at return flights it occurred to us that extending our vacation wasn’t out of the question; with a long weekend’s worth of time, we figured we could head to Europe for a few days to seek respite from Africa’s heat. 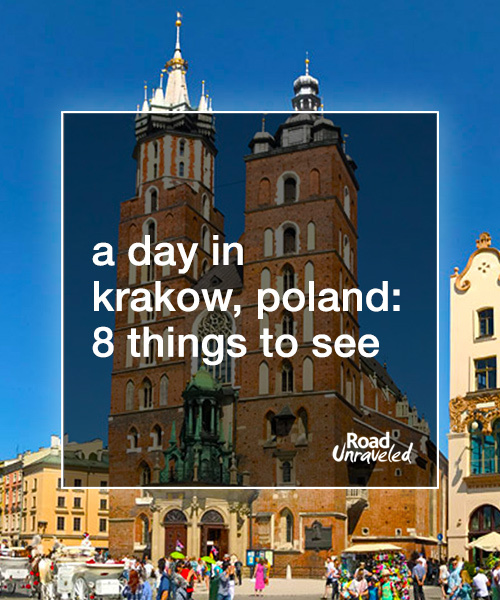 After some searching, I found that the cheapest airfare from Marrakech was, inexplicably, to Krakow, Poland. Sure, we would have to connect in London, but the cheap tickets were worth it. Even as we said goodbye to an incredible experience in Morocco, we were a little giddy when we thought about a few days of kielbasa and pierogis in a city we had never seen. Krakow captivated us from the very beginning. By the time we landed it was late in the day. We took the convenient airport train to Krakow Glówny, the main train station; our hotel was just a five-minute walk away. 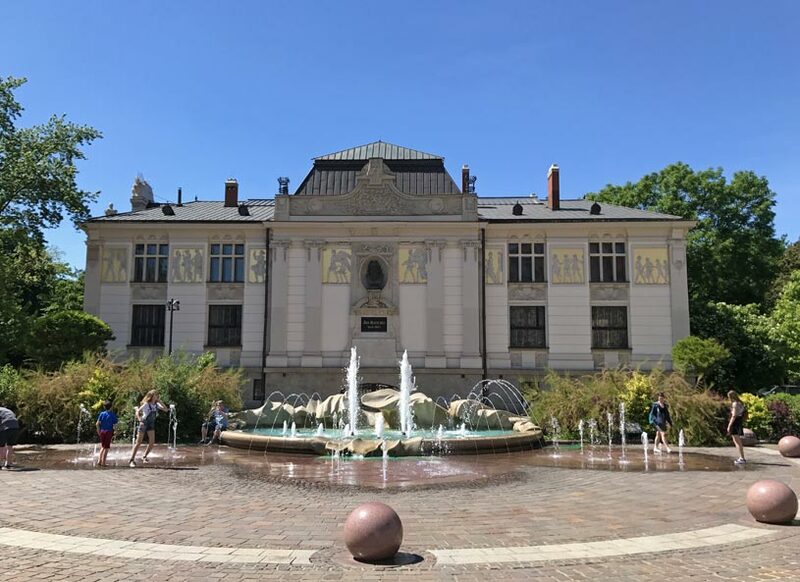 We fell asleep quickly and deeply, although not for long; we had an early wakeup call for a guided tour of Auschwitz-Birkenau during the morning and a Krakow food tour during the evening, so it wasn’t until our second day that we had a chance to explore the city on our own. 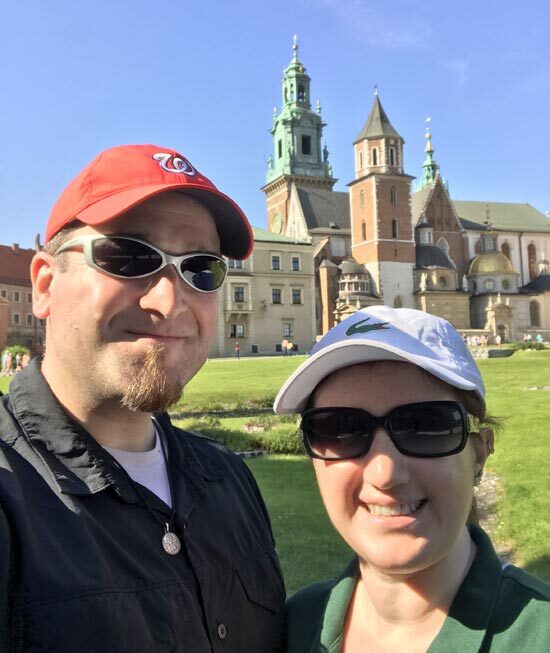 Thanks to a series of days where sleep was hard to come by thanks to our packed itinerary, we started our day in Krakow much later than we usually do. It was almost 11:00 AM when we emerged from our hotel (we were late but well rested—we both slept for more than 10 hours!). 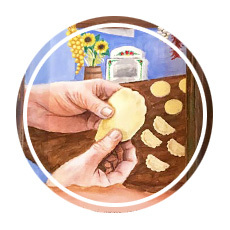 We had two missions that day: eat pierogis and learn something new. By noon we were comfortably settled into Pierogarnia Krakowiacy in Krakow’s old town, tucking into huge plates of freshly made dumplings. I inhaled my order of traditional sauerkraut pierogis while Adam devoured his slightly less conventional roasted tomato and mozzarella pierogis, and we split some that were full of cherries and covered in sweet cream for dessert. We had big plans to find more pierogis later in the day, but that idea never came to pass; we were full until bedtime thanks to our huge lunch. With one mission complete, we had the biggest and most important one remaining. 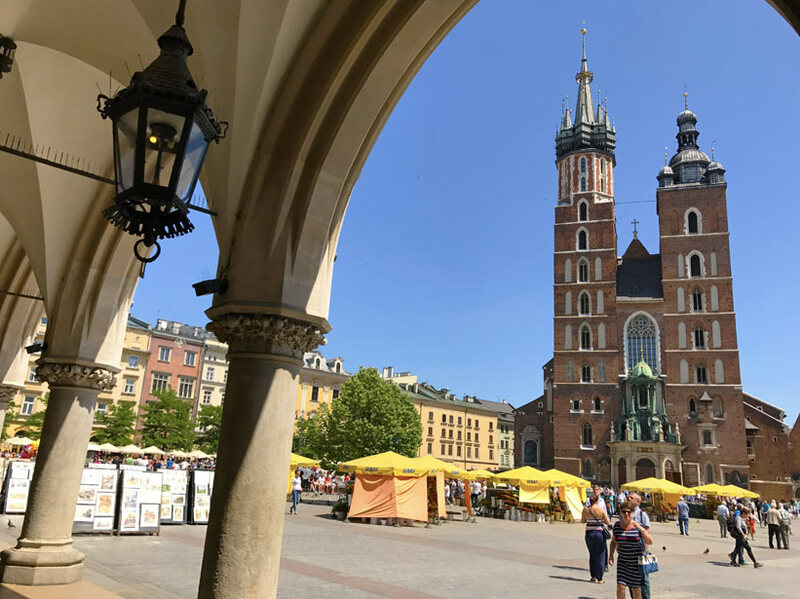 We decided to spend the bulk of our afternoon touring the city on foot, and we met up with a huge group of fellow tourists with the same idea for a free walking tour of Krakow. Like several other European cities, Krakow has a couple of organizations that offer free city tours, accepting donations as payment in any amount that you deem the tour to be worth. 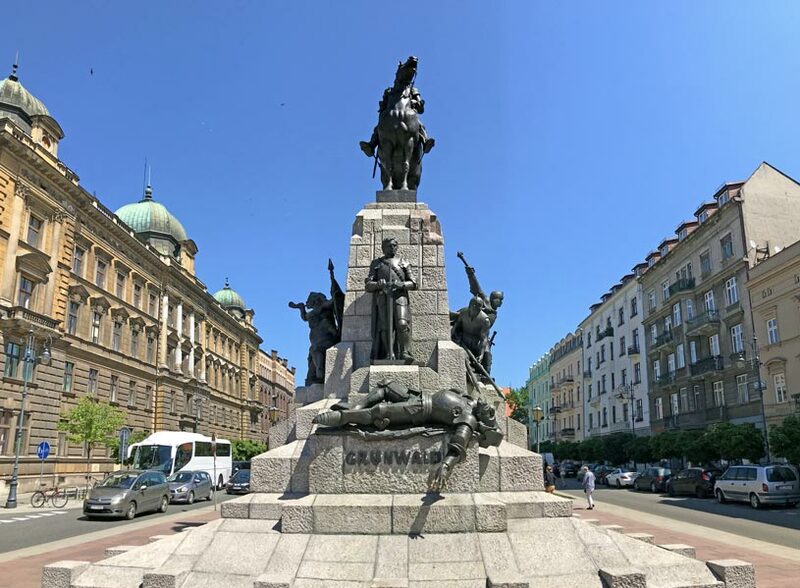 We find tours like this to be a great value—they are informative, led by trained tour guides, and hit all of the major historical and cultural stops you would expect from other tours. 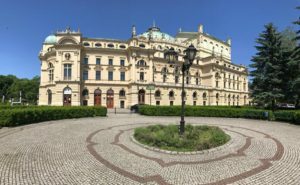 After two and a half hours of walking through Krakow’s Stare Miasto, we found eight spots that you can’t miss when you plan your own trip to the beautiful, scenic city. We walked by the Barbican several times before we were formally introduced to its significance and history. Because of its location in the city, it’s one of the first major sites that many people will see during their visit. Built late in the 1400s, the Barbican was a major fortification in the city, and even today it is one of just three like it still in existence. 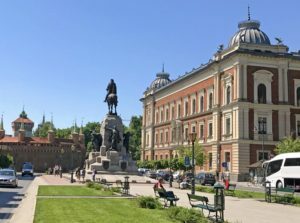 During the time it was built, Krakow was actually in Czech territory, and it served as a trade city for people on the Amber Road en route to the Baltics capitals. Medieval walls constructed to protect the city have since been torn down, but the Barbican still stands as both a beautiful tribute to engineering and architecture as well as a reminder that the city once required somewhat sophisticated defense methods. Once connected directly to the Barbican, by a drawbridge the Florian Gate was erected around the year 1300 as a watchtower within the city wall structure. It was deemed necessary due to the threat of a Mongolian invasion. 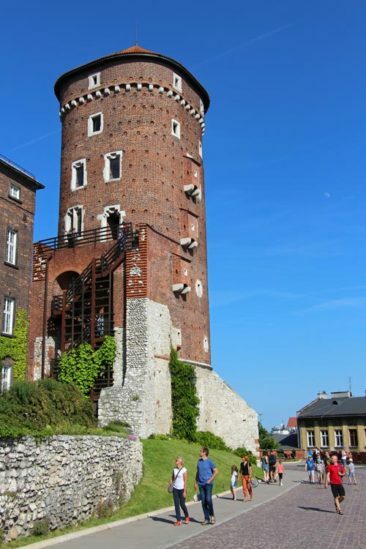 The tower was the main entryway into Krakow at that time, although eventually more than 30 towers were added to the city walls. In the mid-1800s, the city decided to completely tear down the walls as part of an effort to modernize the city. 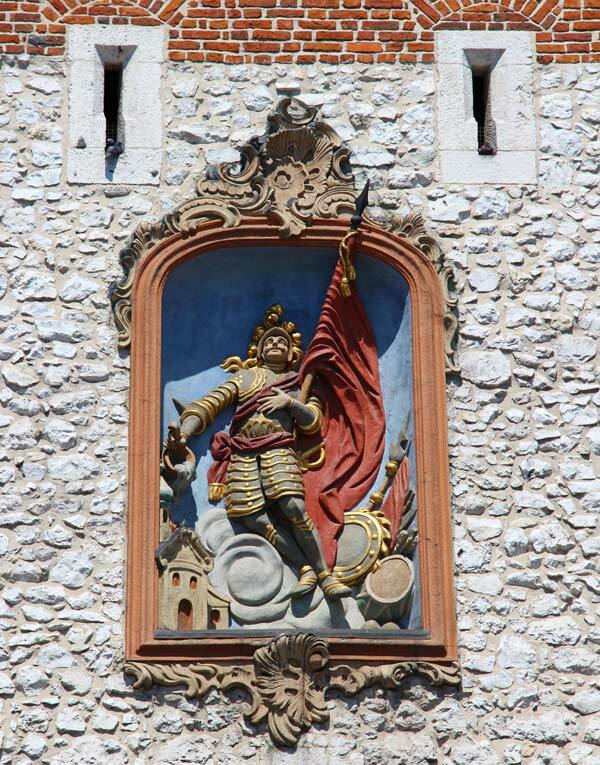 The Florian Gate was the only tower to be protected from the ordered destruction, and today it remains the only existing structure of its kind in the city. 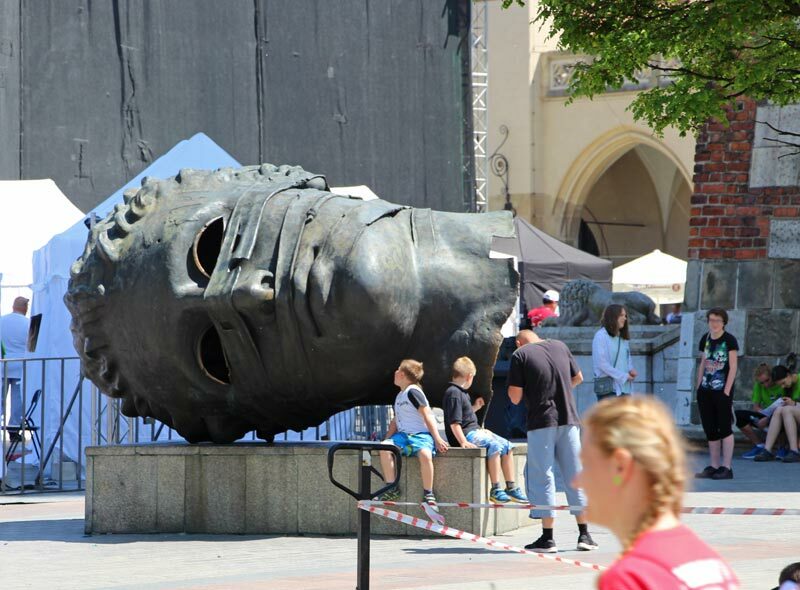 One of the largest medieval battles is commemorated in Krakow just outside the old town. The Battle of Grunwald, fought on July 15, 1410, is proudly remembered by the Polish as being a decisive victory over the German-Prussian Teutonic knights. 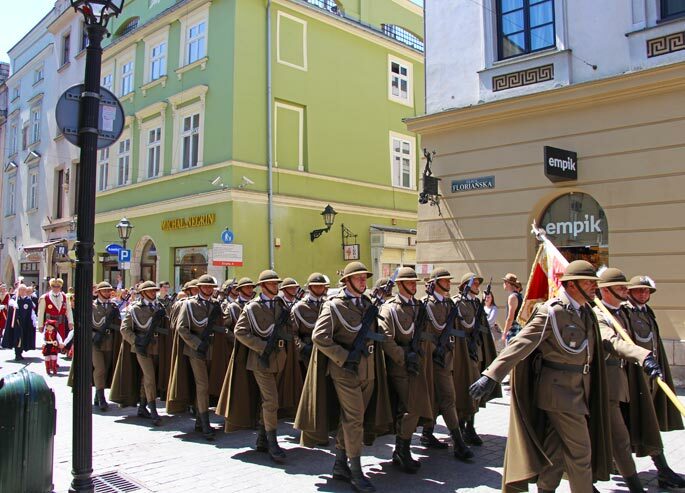 In addition to being a great victory for the Polish (as well as their Lithuanian allies), that battle acted as a turning point in the Polish-Lithuanian-Teutonic War. The Teutonic soldiers never quite recovered, and the financial ramifications were so great that they were never able to truly challenge the Polish and Lithuanians again. This began an exciting but brief road to glory; our tour guide reminded us that, when your country is situated between Germany and Russia, independence and peace can often be short-lived. 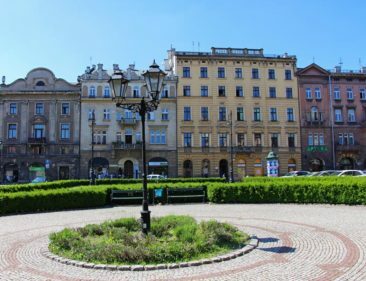 We expected to find beautiful buildings steeped in history, but Krakow’s green spaces took us by surprise. Planty Park spans more than five acres and surrounds the Stare Miasto with its grass, trees, and shaded benches. 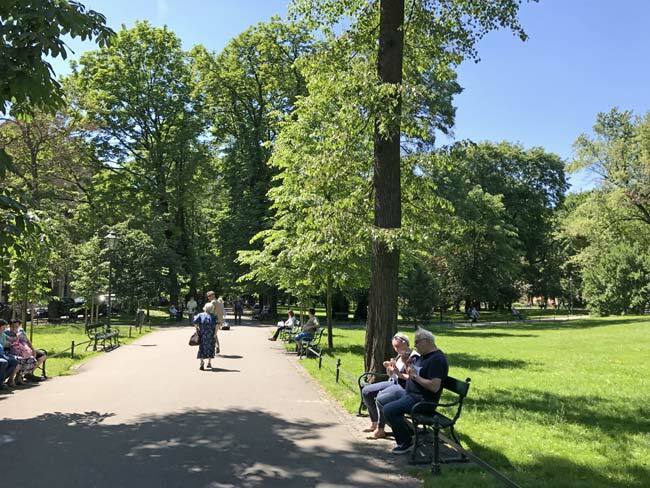 The park developed in the 1820s and is still a very popular place to walk and relax for locals and tourists alike. We enjoyed it for both of those reasons- after walking close to ten miles during one day, we spent 20 happy minutes resting our tired feet and people watching. On fresher legs the day before, though, we walked quite a bit of the loop to see some of the statues and fountains that add to the ambiance. Adam especially loved Planty Park because it reminded him of Portland’s park blocks, an area of Portland, Oregon close to where he went to college. 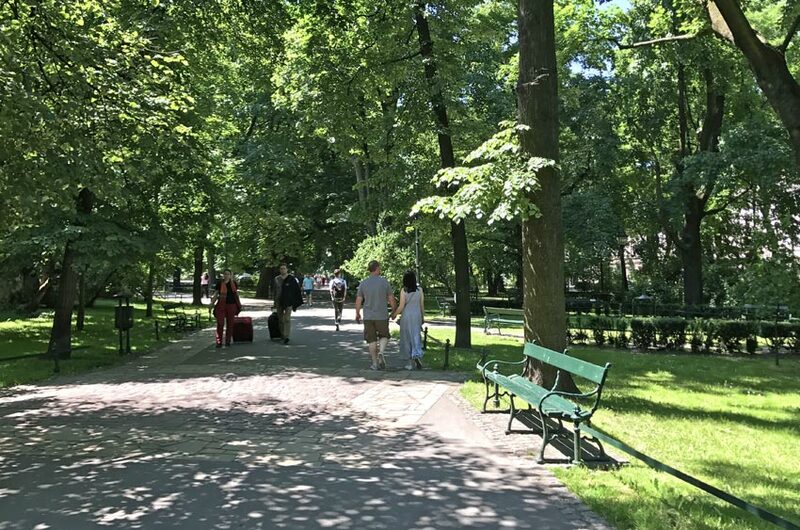 Not every city is able to incorporate green space so well, which made us grateful to experience it in Krakow. 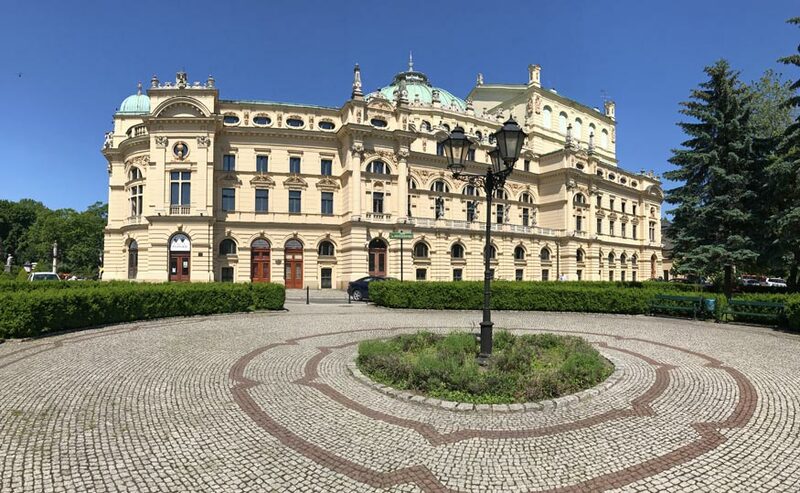 Modeled after some of the most gorgeous theaters in Europe, the Juliusz Slowacki Theatre reflects Krakow’s commitment to the arts and culture—in fact, it was born from a new to establish the city’s cultural identity. In the late 1800s, Poland’s Era of Insurrections was coming to a close, which marked the end of centuries of uprisings and instability for the Polish people. There was a nagging fear that the country could be infiltrated yet again. 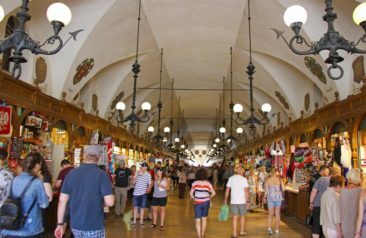 Krakow especially was looking for a way to make locals feel Polish again; the city desperately needed a common cultural identity that they could share and in which they could be collectively proud. The theater was built out of this need. 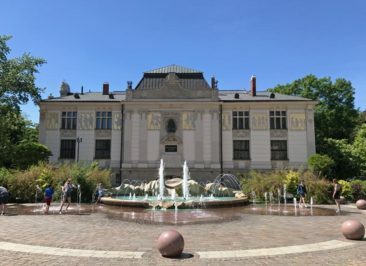 The theater’s doors opened in October 1893, and with the exception of the years in which it was occupied by the Nazis during World War II, the theater has produced Polish plays for more than 100 years. 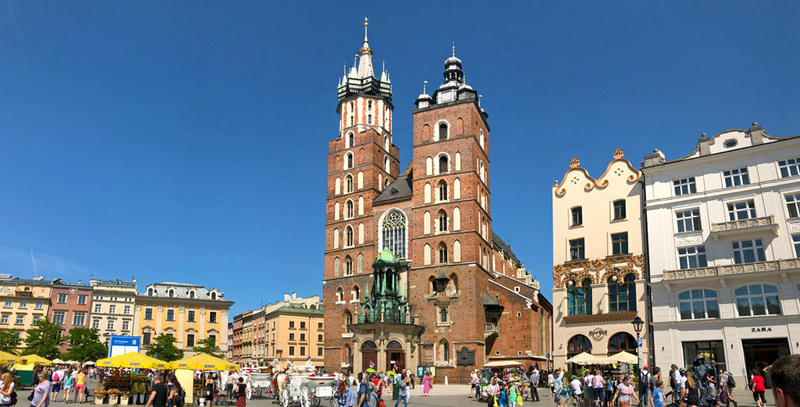 There’s almost no way you can miss the impressive St. Mary’s Basilica in Krakow’s main square. If you somehow manage to overlook the enormous structure, you will certainly hear the characteristic trumpeting coming from its windows at the top of each hour. St. Mary’s Basilica was initially built in the early 1220s, although it was completely rebuilt about a decade later. For years modifications were made, including the addition of side chapels, long windows, and a new alter. 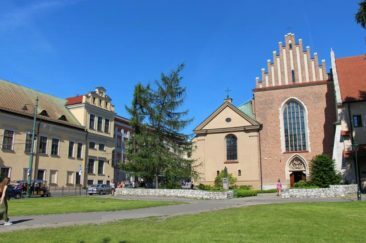 Today, the church is a central point when it comes to Krakow tourism, and it is acknowledged as an important representation of Polish Gothic architecture. My favorite part of St. Mary’s Basilica, though, is the trumpeter. 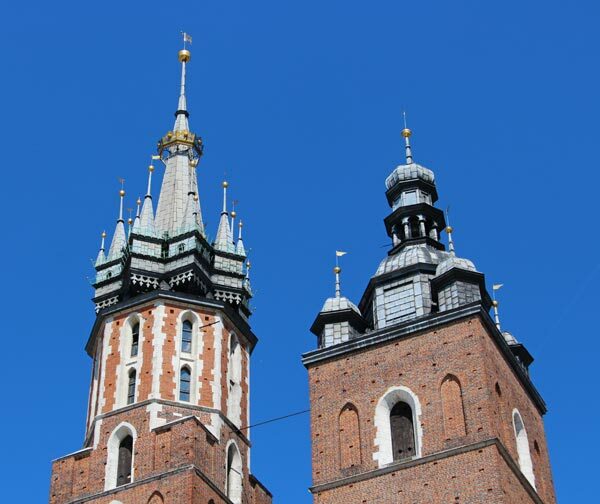 St. Mary’s has two towers—one is a bit taller than the other—and every hour a tune called the Hejnal Mariacki is played from the top of the taller tower. 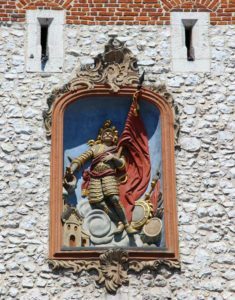 The trumpet call is played in each of four directions, once aligned with towers (although today only the Florian Gate remains of the four), and when it first started in the 1300s it signaled the opening and closing of the city’s gates as it was played just twice a day at dawn and dusk. Notably, during the fourth time the tune is played, the final note is cut short. While there are a few legends that explain why this tradition is in place, the most commonly accepted story is that the trumpeter was shot in the throat during a Mongol invasion in 1241, so he did not complete the song. This legend was, ironically, popularized because an American heard it through a rough translation during a visit to Krakow and wrote a children’s book about it. While I’m not sure I trust a version of the story as told by someone who isn’t a Polish citizen and heard it from someone who likely didn’t translate it well, Krakow locals adopted the legend and widely share it to this day. Wawel Hill is home to some of the most important culturally significant buildings in the entire country. 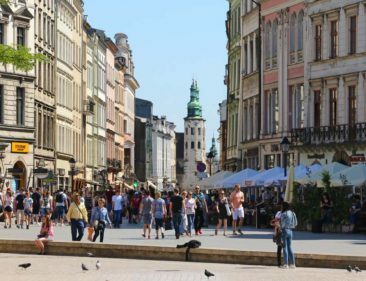 Populated since the 900s—more than 1,000 years ago!—the entire area is a can’t miss stop on an Krakow itinerary. 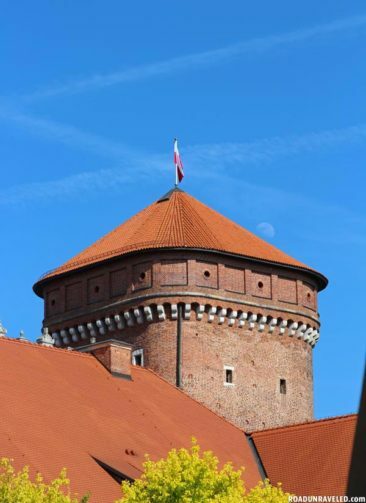 Wawel Castle is a UNESCO World Heritage site, and because it was built and modified over so many centuries it contains elements of a variety of different period styles, including Medieval, Baroque, and Renaissance. The earliest residents used the space to trade and sell crafts and crops, and in the 1600s it became the site of the magnificent castle that still stands. 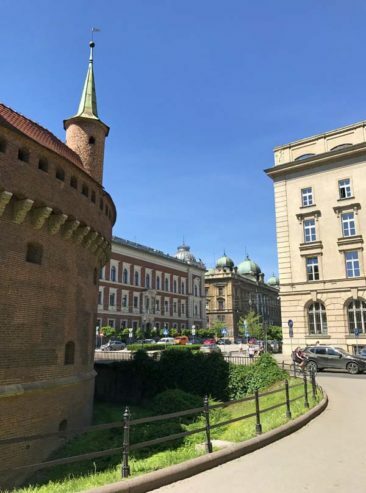 The castle had many roles in Krakow’s history; it served as a defensive fortification, it was burned down and rebuilt, and it was occupied by several invading armies during its time. 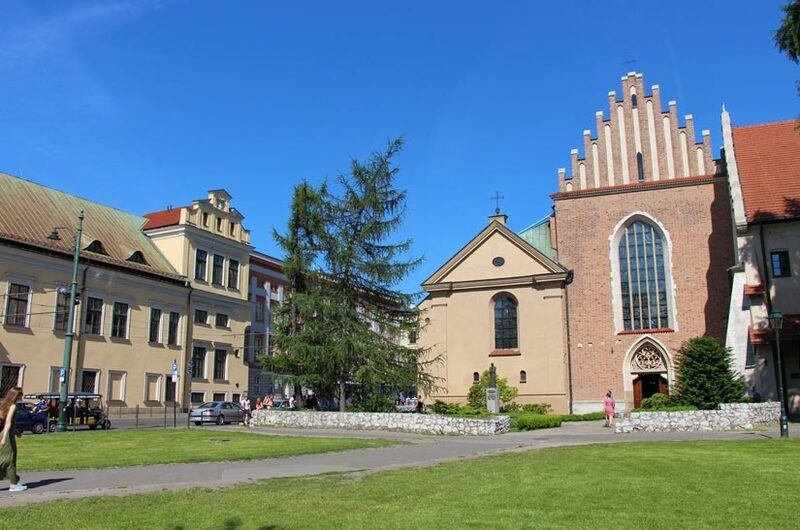 Today it enjoys a much more quiet place in Krakow’s culture as a museum and tourist attraction. The castle centers around a lovely courtyard, although benches situated throughout the complex provide equally nice views of the building and Krakow itself. 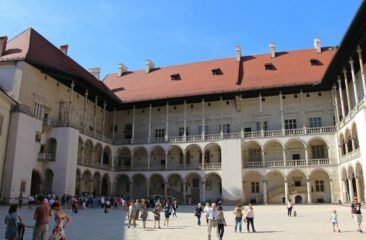 Wawel Cathedral is a Roman Catholic church that is more than 900 years old. 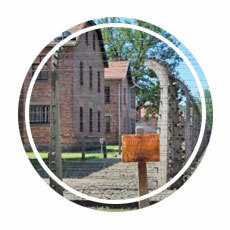 One of its most interesting pieces of history is much more recent, though. In 1946, Karol Wojtyla offered his first mass after being ordained as a priest in that church. 30 years later, Karol Wojtyla would become Pope John Paul II. 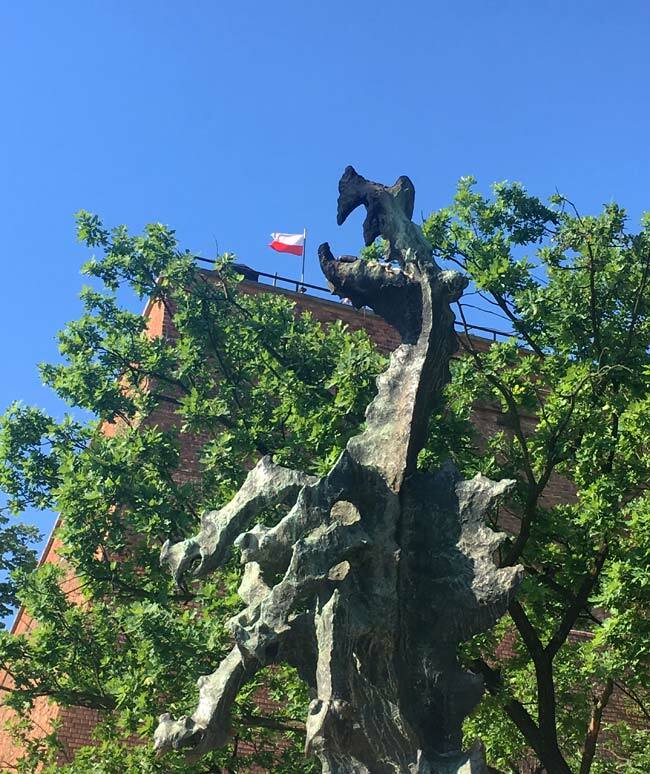 Wawel Hill isn’t without its legends, and our favorite is that of the Wawel Dragon. 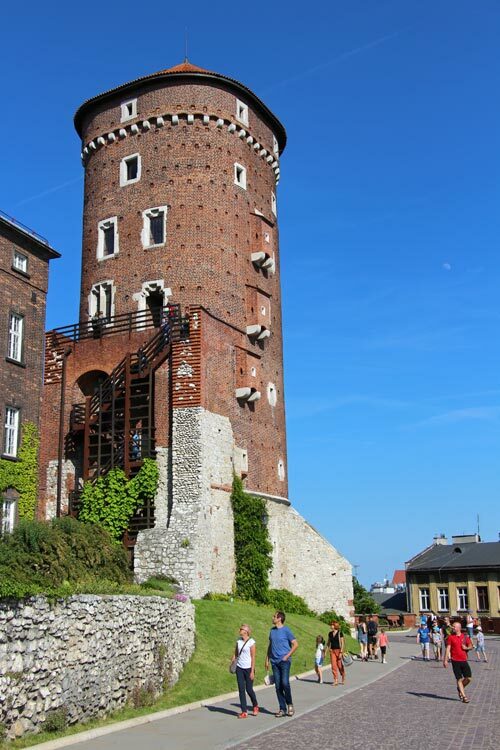 The most popular telling of the story features an angry dragon living on Wawel Hill and terrorizing the locals. King Krakus had enough of the dragon’s shenanigans and promised his daughter’s hand in marriage to anyone who could slay him. Skuba, a cobbler, finds an ingenious way of taking out his fire-breathing foe; he stuffs sheepskin full of sulfur and tosses them into the dragon’s lair. The dragon, excited to have a few snacks land right at his feet, eats them all. The snack leaves him with an unquenchable thirst, though, and after drinking more water from the nearby River Vistula than his body can digest he explodes. Today, a dragon statue commemorates the creature; if you wait and watch closely, he does breathe actual fire! 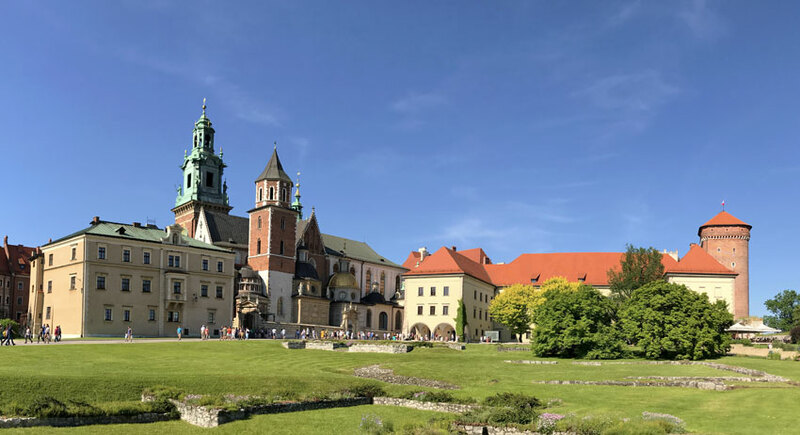 Bishop’s Palace has been the residence for bishops in Krakow since the 15th century, a fact our guide shared along with the somewhat surprising note that Krakow is home to the largest population of priests and nuns outside of Vatican City. 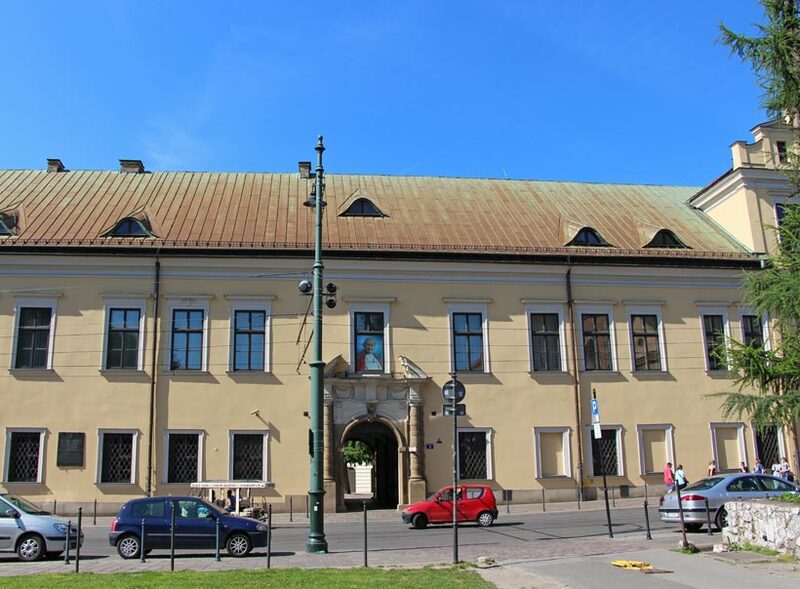 Plagued by the same fires and invasions that much of Krakow endured, the palace became the home for the city’s priests when they moved from Wawel. The best story we heard, though, was about a visit Pope John Paul II made to the city in the 1970s. A group of students sat outside his window and sang songs for hours. Late in the evening, the Pope opened his window and told them to keep it down—he was trying to sleep! He then laughed, told the crowd he was kidding, and sang along! He spent much of the night singing and talking with the students. 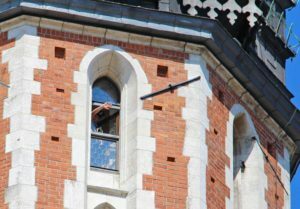 Pope John Paul II is a bit of a rock star in Krakow, and tales like that represent just how much of the city’s history he still is. The Mercure Krakow Stare Miasto is a four star hotel that feels like a world-class five star hotel. The staff was phenomenal; they were very welcoming when we arrived as well as when we had questions to ask of them. The rooms were clean, comfortable, and surprisingly modern. We especially liked the bathroom, which had a terrific shower. 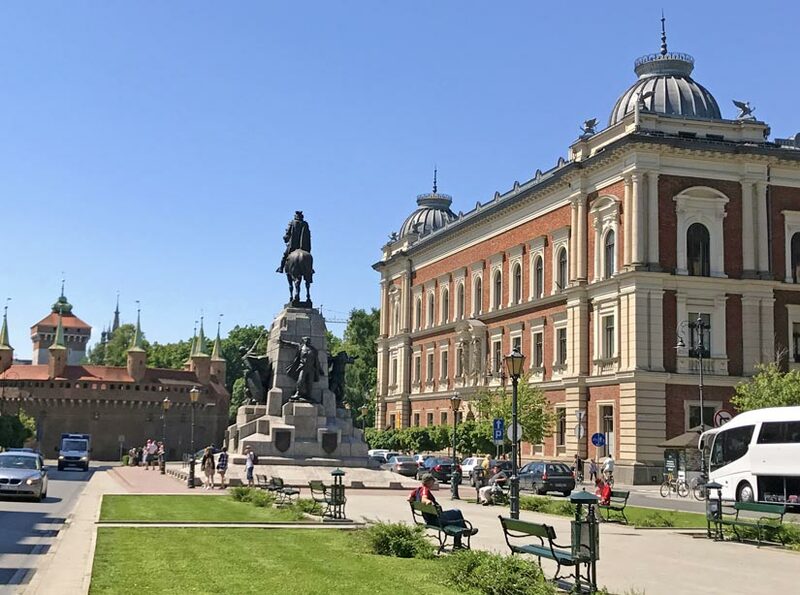 The location is a short walk to a lot of tourist destinations and even more restaurants, and it’s right next to the train station that runs to the airport. 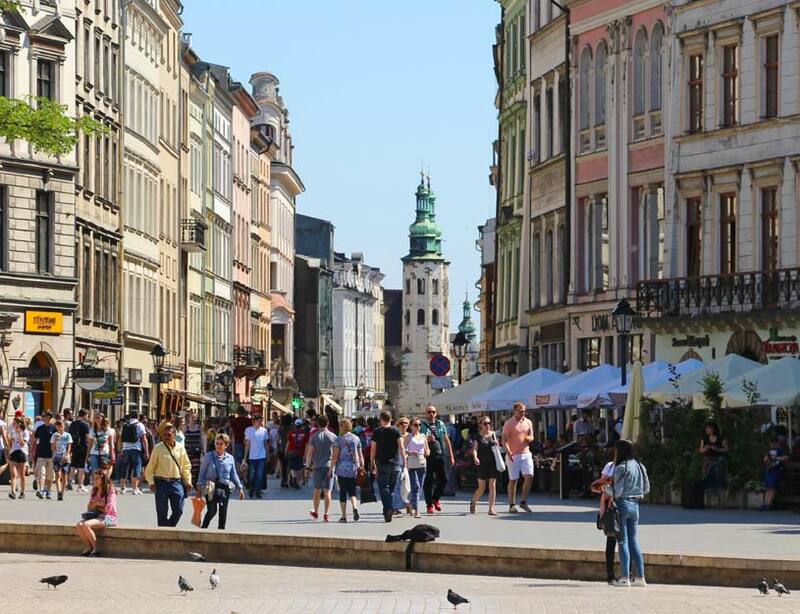 We thoroughly enjoyed our stay and were really happy to have it as our home base in Krakow. There is way more to Krakow than just these spots, but visiting each of these will provide you with a great overview of this impressive city’s history and culture. Whether you have just a day or a couple of weeks, make sure these seven spots make it into your Krakow itinerary! Here are a few more of our favorite pictures from our time in Krakow! 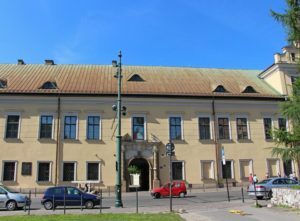 Planning a visit to Poland? Here are a couple posts that might help you plan your trip. * From time to time, our travels are directly impacted by a service or company. In this case, we booked a day tour with Free Walking Tour Poland, and this post includes our candid review of our experience. 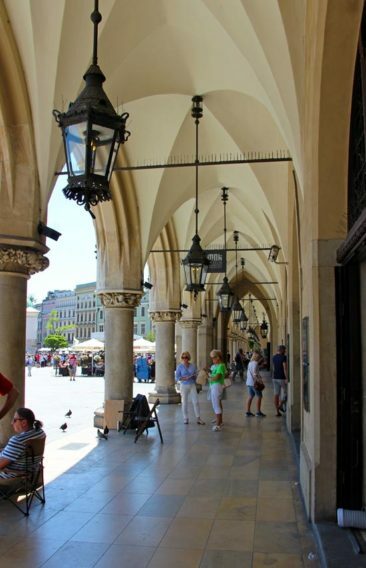 We selected Free Walking Tour Poland based on our own research and travel needs; we were not offered and did not receive compensation of any kind from them or any other party in exchange for our review.